Event management involves studying the intricacies of the brand, identifying the target audience, devising the event concept, planning the logistics and coordinating the technical aspects before actually executing the proposed event. Event Management is a serious career option, and very rewarding. The launch of iconic projects such as the Atlantis, the impact of exhibitions such as GITEX, The Air Show, and the huge investment in sporting events such as the Cricket World Cup, Tennis Championships and Formula 1 - demonstrates that the world is an event managers paradise. Governments are realizing the power of events and tourism, with a plethora of shows, concerts, festivals and carnivals aimed at attracting tourists and locals alike. Across all the different categories of events - from Sporting Events, Music Concerts, Exhibitions, Trade Fairs, Seminars, Product Launches, Gala Dinners, Weddings, Festivals and Carnivals and other live events. There is a huge potential for employment and entrepreneurship- where freelance professionals are often sought after for their services. All our courses are certified by Pearsons, UK. 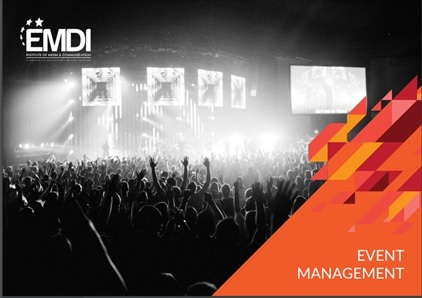 EMDI is a Member of ILEA-ME (International Live Events Association - Middle East). All our students are sent to work on live events. Which means you as an EMDI student can work on events such as the Global Education Skills Forum, Jazz Festival, Runway Fashion Week, product launches, music concerts (Western, Indian & Arabic) and other events. On average, we work on over 100 events a year, which means students can work on 10-40 events each year. The course is structured so that working professionals and students can both attend - lectures conducted in the evenings and live event internships also happen on weekends. Great placement and internship record - just check out our Facebook for more details. Excellent way to network in the events and media environment. Learn from the Industry, Work with the Industry, Placed in the Industry.